An exciting new book about the life of John Muir is now available in America﻿. 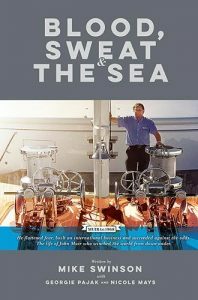 ﻿”Blood, Sweat & The Sea” is a must read for anyone that loves boats, is interested in success stories, and enjoys nautical history. It is the story of John Muir, his family, his work, and his life. How through hard labor, clean business practices, and dedication he rose-up from the rough and tumble streets of Battery Point, Tasmania to build a successful International engineering company.